A team of scientists observed magnesium oxide in extreme pressures and temperatures to understand what is happening deep within the Earth's layer and found some surprising results. 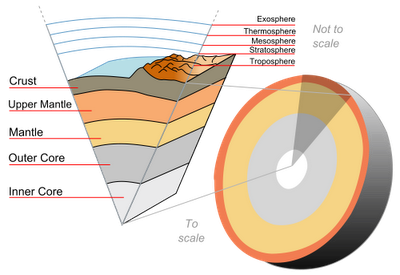 The mantle of the Earth is a layer of thick rocky substance and is found between the crust of the Earth and the Outer Core. It is around 2,900 km (1,800 miles) thick and makes up about 84% of the total weight and mass of the Earth. Temperatures in the mantle range between 500 to 900 °C (932 to 1,652 °F) at the upper boundary with the crust; to over 4,000 °C (7,230 °F) at the boundary with the core. The mantles of Earth and other rocky planets are rich in magnesium and oxygen. Due to its simplicity, the mineral magnesium oxide is a good model for studying the nature of planetary interiors. New work from a team led by Carnegie's Stewart McWilliams studied how magnesium oxide behaves under the extreme conditions deep within planets and found evidence that alters our understanding of planetary evolution. It is published November 22 by Science Express. Magnesium oxide is particularly resistant to changes when under intense pressures and temperatures. Theoretical predictions claim that it has just three unique states with different structures and properties present under planetary conditions: solid under ambient conditions (such as on the Earth's surface), liquid at high temperatures, and another structure of the solid at high pressure. The latter structure has never been observed in nature or in experiments.